Sintratec announces a new reseller: KVT-Fastening, a branch establishment of the Bossard AG Switzerland. 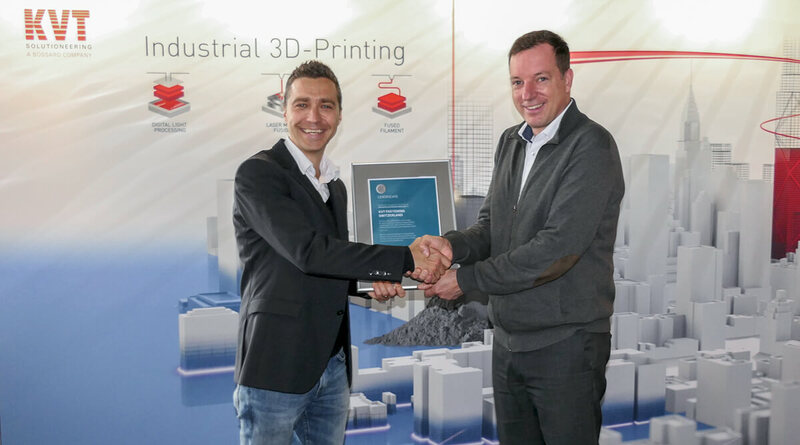 In this way, the leading Swiss developer and manufacturer of compact 3D printers expands its distribution channels in its home market. Brugg, November the 12th, 2018 – KVT-Fastening is joining Sintratec’s growing distribution network and will be marketing Sintratec’s selective laser sintering (SLS) solutions to the Swiss market. KVT-Fastening, a renowned specialist for fastening and engineering founded in 1927, has built up a comprehensive 3D printing portfolio in recent months. Therefore, KVT-Fastening is able to offer the appropriate solution according to the customers’ needs – now also in the field of 3D printing. «The introductory models Sintratec Kit and Sintratec S1 as well as the fully integrated system solution Sintratec S2 perfectly complete the KVT portfolio of additive manufacturing», explains Mr. Thomas Kraushaar, managing director of KVT-Fastening Switzerland. In the fastening industry market, the KVT-Fastening subsidiaries are important players: Their focus markets are Germany, Austria, Switzerland as well as Central and Eastern Europe. The main logistic centres in Dietikon (Switzerland), Illerrieden (Germany) and Pichling/Linz (Austria) register over 25’000 active customers. The KVT-Fastening subsidiaries belong to the global Bossard-Group.